The American Andrew Stark (1852-1920) from Chicago was a prolific inventor from late 1800s and early 1900s. He is a holder of quite a few patents for agricultural machines and furniture like: grain-binders, harvesters, railway facilities, folding bed, sofa, fiber vessel, etc. In 1884 Andrew Stark patented two rather interesting adding machines, which deserve our attention. Actually, the first patent (US patent №308528) of Stark was assigned to La Verne Noyes (another engineer, inventor and businessman from Chicago), while in the second patent (US patent №308570) La Verne Noyes is specified like a coinventor and assignee. The first adding machine of Stark and Noyes has a series of numeral wheels (see the lower patent drawings), each provided with 3 sets of figures running from 1 to 9 and 0. Pivotally mounted upon the axis of the numeral wheels at each end are sector gears E1 and E4, in which are pivoted a square shaft E, extended from one arm to the other across the face of the numeral wheels. The shaft E, is claimed to be held in its normal position by a spring so that a pawl, E2, shiftable mounted on the shaft, designed to ratchet or actuate the numeral wheels forward, may engage with anyone of the numeral wheels ratchets. A bail (marked D), is pivoted to standards A1, of the frame of the device, and is provided with 2 radial racks D3, which mesh with the sector gears E1. It may be conceived that the act of depressing the bail D, will cause the actuating pawl E2, to operate whichever numeral wheels it engages the ratchet of. The bail D, is held in its normal position by a spring D2, and is provided with nine keys or finger pieces d, eight of which co-act with the stepped plate G, to regulate the additive degree of rotation given to the numeral wheels, while the ninth has a fixed relation with the bail and the bail itself is stopped. 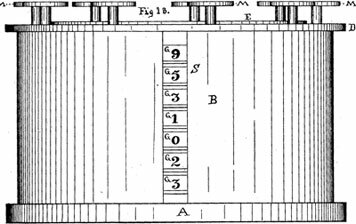 The keys d, marked from 1 to 8, are pivoted to the bail in such a manner that their normal relation to the bail will allow them to pass by the steps on the stepped plate G, when the bail is depressed by the fixed No. 9 key. When, however, anyone of the keys numbered from 1 to 8 is depressed, the lower end of the shank of the key will tilt rearward, and, as the bail is depressed, offers a stop against the respective step of the plate G, arranged in its path, thus stopping further action of the actuating pawl E2, but offering nothing to prevent the continuation of the force of momentum set up in the numeral wheels by the key action. There was small use in stopping the action of the pawl E2, of the ratchet and numeral wheels, impelled by the pawl, could continue onward under its momentum. The carry of the tens transfer device is of the same order as that described in the machines of Pascal and Hill; that is, a one-step ratchet-motion actuated by a cam lug or pin from lower wheel. The carry transfer device consists of the lever F, and pawl f4, acting on the ratchet of the upper wheel which is operated by the cam lugs b5, of the lower wheel acting on the arms f1 and f2 of the lever F.
The first machine of Stark was provided with but one set of keys, but the arrangement for shifting the driving ratchet pawl E2, from one order to another, so that the action of the keys may rotate anyone of the numeral wheels, gave the machine greater capacity than the single digit adders. 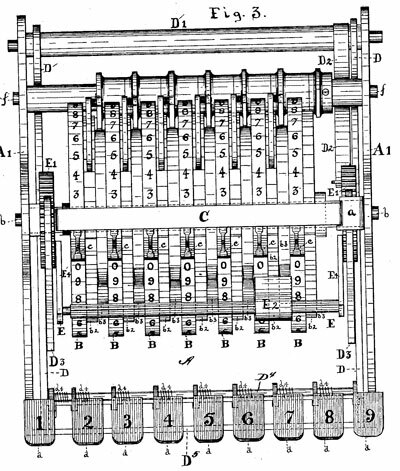 Obviously, there was no means provided by which the rotation of numeral wheels could be controlled, it was merely a device for rotating numeral wheels and was therefore lacking in the features that would give it a right to the title of an adding machine. The second adding machine of Stark/Noyes (US patent №308570 from 25 Nov. 1884, granted to Andrew Stark and La Verne W. Noyes, assigned to Noyes) has different mechanism (see the lower patent drawings). 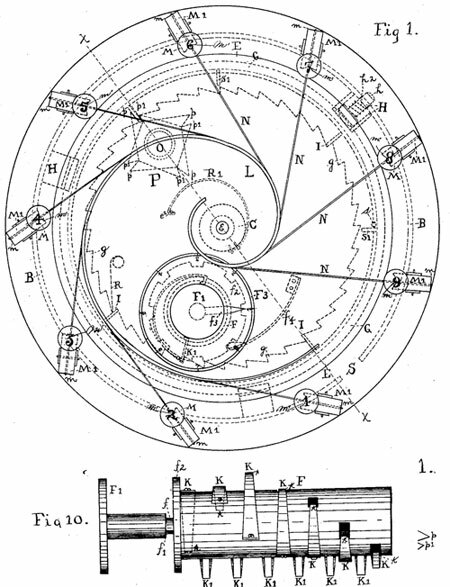 In operating of the machine, starting with all the number-wheels so set that the zeros are visible through the rift S, the pawl-cylinder being so set that the top pawl will be in engagement with the ratchet-wheel opposite it—which is the units wheel-and keys corresponding to the numbers to be added in the units-column being successively struck and depressed, the process of registering the sum and carrying will proceed to any extent, the carrying being automatically effected to succeeding columns, however many figures the sum of the column being added may contain. When the units-column has been added, the pawl-cylinder should be rotated one notch, thereby bringing the pawl which is horizontally opposite the second or tens number-wheel into engagement with that wheel. Proceeding as before with the figures on this column, the addition and proper carrying will be automatically effected, the units-column remaining undisturbed, and in like manner with each successive column until the entire sum is ascertained. To reset the machine at zero, rotate the pawl-cylinder until the line of pawls K' is at the front. 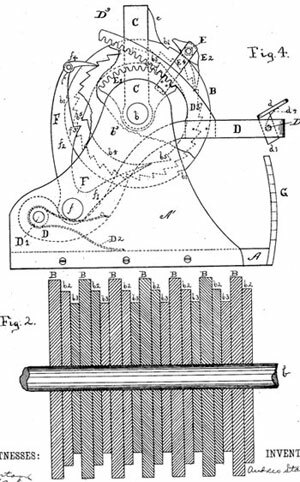 These pawls, alternating with the pawls of the spiral series K, are in such vertical position as to engage with the carrying-teeth of the number-wheels. Now, using the thumb-screw as a handle, the plate E being rotated a full quarter-turn, the distance of ten ratchet-teeth, the pawls K' will bring the carrying-teeth of the entire series of number-wheels into line, and so will bring all the zeros into line. We provide a pin, s, on the plate E and the two stops s' on the rim, so as to limit the rotation of the plate E to the proper distance to cover ten ratchet-teeth, and to end the motion at such point as will leave the zero-line at the rift S, thus leaving the register at zero, as at starting. Little is known about the main inventor—Andrew Stark, but there is more info about the coinventor—La Verne Noyes (see biography of La Verne Noyes). Andrew Stark was born on 19 Mar. 1852, in Chicago, Illinois, as the second child of German Americans John (Johann) (born in 1826 in Bavaria) and Catherine (b. 1824 in Bavaria) Stark. John Stark was a farmer, and besides Andrew, the family had also: Barbara (b. 1851), John (b. 1854), Valentin (b. 1857), Charles (b. 1859), Joseph (b. 1861), Philip (b. 1862), and Catherine (b. 1864). On 17 April, 1877, Andrew Stark married to Elizabeth Klos (18 Sep. 1856–23 Nov. 1932), also from a German American family. They had three children: Elizabeth (b. 1879), Lillie (b. 1880), and Jacob (b. 1882). In the 1880 US census, Andrew Stark's occupation is specified as a cabinet maker. Andrew Stark lived all his life in Chicago, where he died on 16 Feb. 16, 1920, and was buried in Saint Boniface Cemetery.